The Lovers. Photo by Robert Millard. 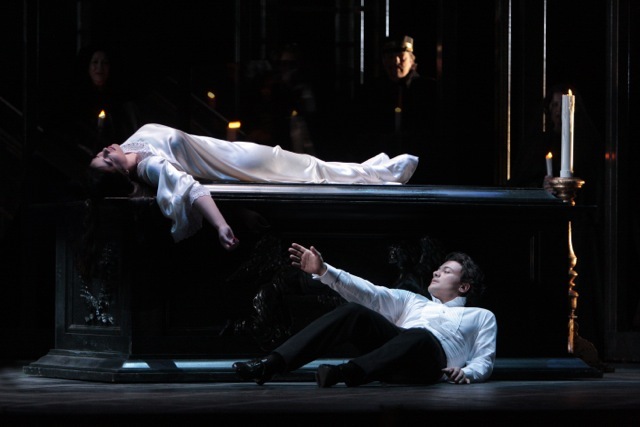 This is the second time around for Los Angeles Opera’s John Gunter designed production of Gounod’s “Roméo et Juliette” and it is perhaps several degrees more sensational than the first time back in January of 2005. Then the Juliette was exciting soprano Anna Netrebko, looking rather more svelte and gorgeous than she does today; and the Roméo was a marvelous Rolando Villazon in fine form vocally and in physical appearance. No one could have imagined then that Villazon’s career would so soon be interrupted by surgery for a cyst on one of his vocal cords or that Netrebko would become so matronly looking (though still quite beautiful) following the birth of her child. I was surprised to see her weight gain during the recent HD Met-to-theaters telecast of Donizetti’s “Anna Bolena”. So, in their place, make way (all too soon!) for another pair of good-looking star-crossed lovers: Vittorio Grigolo and Nino Machaidza, both of them – to put it mildly – sensational in their parts. Machaidza sings gorgeously and makes a thoroughly believable heroine (and, yes, we all know Shakespeare’s Juliet was really 13 or something), while Grigolo seems born to play Roméo. One has to search for animal metaphors to describe what Grigolo does physically. He tears around the stage with cat-like speed and grace, and he scrambles like a monkey over a multi-tiered set conveniently designed to look like an intricate scaffolding for a building or a street scene that was somehow never finished. Grigolo also knows exactly what character he is playing and he stays in it all times, just like the best of professional stage actors. And although there are more glorious Roméos on recordings, it would be difficult to fault Grigolo’s singing. I find the voice not as sweet and ringing as I would like, but he produces a secure and even masculine sound through all his registers — and his top notes are wonderfully secure. He also sings with a surprising degree of dynamic sensitivity, astonishing given the almost undisciplined exuberance of much of his acting. Jussi Bjoerling, for my money the greatest Roméo of all, could never have done what Grigolo does on stage in a million years. Machaidza is a remarkable singer at the moment. I have enjoyed everything I have heard her do. She has a full warm sound, and she does not have to struggle at all to adjust the part vocally as she progresses from the agility of her initial “Je veux vivre” to the taxing drama of the potion scene towards the end of the opera. She also knows how to convey and stay in a character. On the other hand, while I found both singers wonderfully enjoyable, I was never deeply moved. One’s own “tear-o-meter” is, of course, personally and individually adjusted. Mine hardly registered a drop. Superbly directed by Ian Judge and nicely conducted by Placido Domingo (who seems only to lag in the most energetic of passages), this “Roméo” flowed along magnificently and seamlessly, scene into scene. It truly helped one realize how well constructed, how beautifully composed Gounod’s work is with its skillful libretto by Jules Barbier and Michel Carré. The use of chorus, I think, is particularly inspired, and Judge accents this aspect in inventive ways. He makes much use of the multiple levels, although when these spaces are emptied of the crowds, one is reminded of passengers awkwardly deplaning an aircraft. (Thank God they do not have overhead baggage.) Dressed in costumes (Tim Goodchild) that presumably reflect the period of the composition of the opera, the large mixed chorus opens the opera in full mourning mode, with the bodies of the lovers lying nearby — and then the black cloaks are shed revealing the formal suits and dance gowns for the Capulet’s ball. Similarly deft traditions like these abound. The Capulet's ball. Photo by Robert Millard. In general the cast is quite strong. 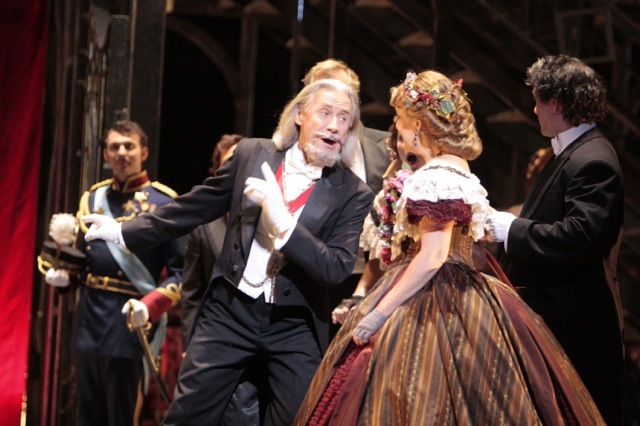 As Capulet, Vladimir Chernov becomes a charming host who, remarkably, seems to be welcoming us all to the opera, inviting us to enjoy ourselves despite all misfortune. As Mercutio, Museop Kim is most kinetic and engaging, if not vocally dazzling. The Tybalt, Alexey Saypin, displays a distinctive clear tenor sound and appropriately supercilious demeanor. The accidental trouble maker, Stephano, was mezzo René Rapier, an evening replacement for a MIA Elena Belfiore, and was excellent in her small role opening afternoon. Vitalij Kowaljow is touching and authoritative as Frere Laurent. Mezzo Ronnita Nicole Miller works well to make the nurse’s character come into focus, and Philip Cokorinos seems imposing as the crisis-pressed Duke of Verona. Vladimir Chernov as Capulet -- quite the host. Photo by Robert Millard. Production elements are outstanding. Intricate, effective lighting by Nigel Levings; very serviceable choreography by Kitty McNamee; and impressive fight direction by Ed Douglas. Grant Gershon’s chorus delighted as usual — as did the players of the Los Anegles Opera Orchestra. Do stay to see Mr. Grigolo’s inimitable curtain calls. One certainly gets the impression he’s having a great time and that he loves himself and what he is doing very much! Still no happy ending. Photo by Robert Millard. it sounds like you outdid the super cast of the 2005 romeo et juliette with Anna and Rolando in the same production and with the one and only don Placido Domingo conducting, I congratulate you both and hope you will bring the show to san francisco in the near fuure. nino dell’alma mia, lo sapete bene che il lupo crepo yeri pomeriggio. I loved both versions of this Romeo and Juliet but somehow, this one flowed even better than the Netrebko/Villazon previously. Loved the cast! 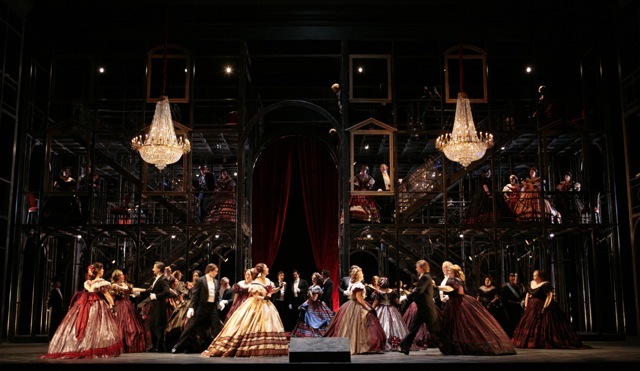 The afternoon I saw it – Domingo’s conducting was terrific! I know Domingo isn’t always the best conductor but as he really seems to try too hard but we here in L. A. appreciate him so very much as singer, director, coach, mentor and conductor. Grigolo is definitely the real deal and glad to have seen him in person as I was Kaufmann this year – what terrific tenors! Nina’s voice not the typical for Juliet but I loved her too! Excellent acting as well. Was the highlight of the season so far!